Regular readers of Retirement Investing Today will already know that I personally think National Savings and Investments (NS&I) Index Linked Savings Certificates are a good investment class and I currently hold 19.7% of my Low Charge Portfolio in them. A previous post detailed why I like them however I wanted to learn a little more about them given my large holdings. A web search turned up very little so I have had to do some analysis of my own. I have followed a similar style of analysis to that of all the asset classes I invest in or someday would like to invest in (these can all be seen in the right hand side bar under Latest Charts) that I regularly post about however because of their complexity the analysis is not perfect but in my opinion more of a trend. - Index-linked Savings Certificates are meant to be held for a fixed term. Returns are therefore added on the anniversary of each purchase only. - They provide protection against inflation (the Retail Prices Index – RPI) with guaranteed interest on top. 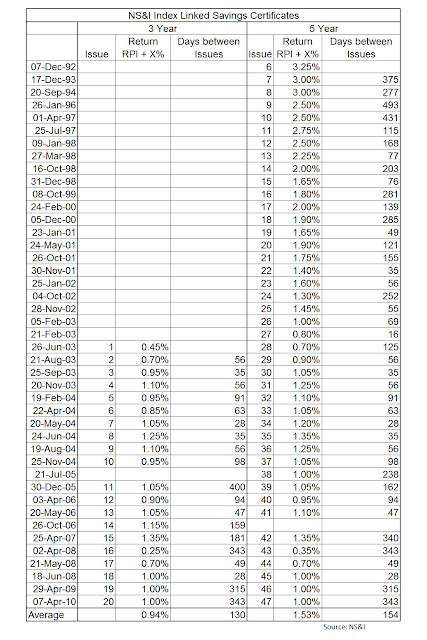 The RPI part is calculated by taking the index at the start and end of each investment year only. If this is positive then it’s added to the anniversary interest rate. If it’s negative then no RPI adjustment is made. - To get the full rate of interest you must hold the certificates for the full term. For example the current 3 year 20th issue pays RPI+0.85% of purchase price for year 1, RPI+0.95% of 1st anniversary value for year 2 and RPI+1.21% of 2nd anniversary value for year 3. - If you keep then less than a year you earn neither RPI nor any interest. I must however say that if you’re going to consider buying Index Linked Savings Certificates then please read the Terms and Conditions (which are 3,470 words long) carefully. Why do all investments have to be complicated? - The average return for 5 year certificates since 1992 has been the retail prices index (RPI) + 1.5%. - The average return for 3 year certificates since 2003 has been the RPI + 0.94%. This makes the RPI + 1% that I have just bought here seem reasonable. 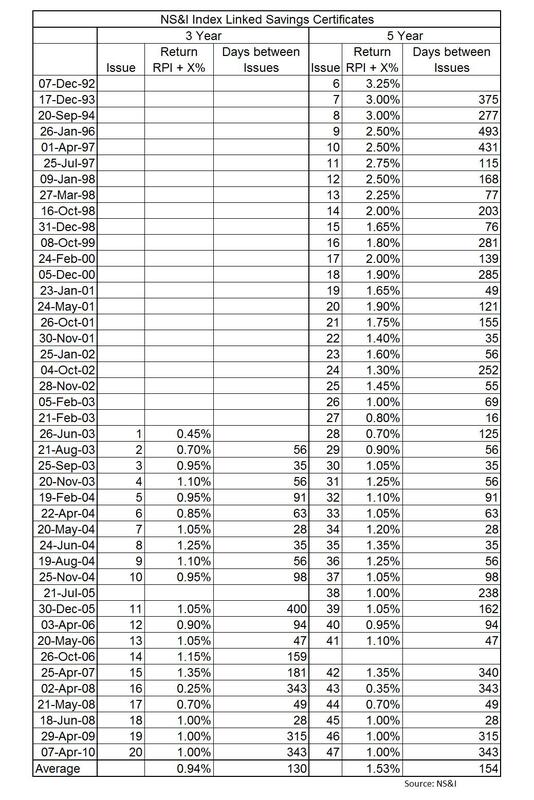 - The frequency of new issues of 5 year index linked savings certificates since 1992 has been on average every 154 days although the periods have been as short as 16 days and as long as 493 days. - The frequency of new issues of 3 year certificates since 2003 has been on average every 130 days although the periods have been as short as 28 days and as long as 400 days. 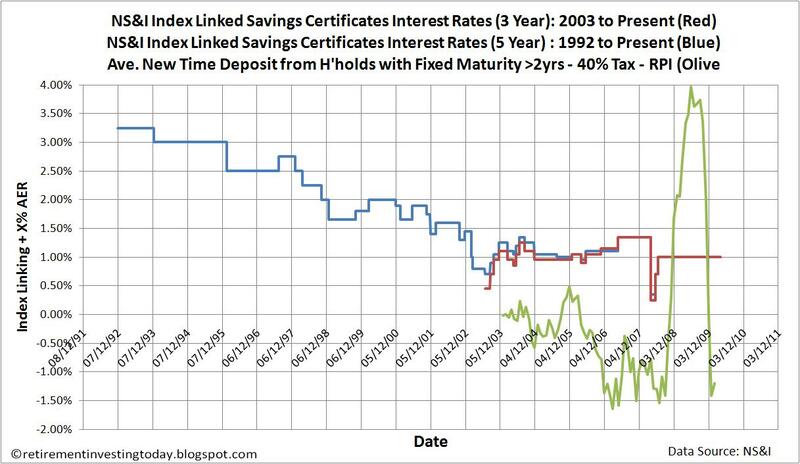 - You cannot always count on 3 and 5 year index linked savings certificates being released together. My chart today is an attempt to assess whether over the longer term Index Linked Savings Certificates are a better bet than cash. 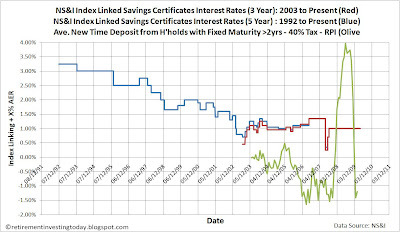 The red and blue lines show approximately the real (after inflation) return of the Index Linked Savings Certificates. This is not adjusted for tax as no tax is paid on the certificates. The olive line shows the approximate real return of a typical cash investment. This is calculated by taking the cash return and then subtracting tax at 40% (as I’m a 40% tax payer) and then subtracting inflation. It shows that for me it is extremely difficult to get a real return on cash with one being achieved in only 23 of the last 73 months. The index linked savings certificates in contrast will always give me a real return. - The certificates annual return shown is only achieved by holding for the full term and should the RPI go negative the real return would actually be higher than that shown. - The certificates real annual return is considered as the headline return available on the day for a new 3 or 5 year investment period ignoring the RPI adjustment. - In contrast the cash annual return is considered as the monthly average of UK resident banks sterling weighted average interest rates for new time deposits with a fixed original maturity of >2 years from households not seasonally adjusted. I have then subtracted the RPI percentage for each month. The last month has really shown the benefits over cash for me. My cash investments have shown an after tax return of 0.1%, my index linked savings certificates a return of 0.76% (using the calculator on the NS&I website) compared with an increase in inflation of 0.68%. Of course the certificates return is an estimate only as I’m not cashing in and so interest and any index linking for the year are only added on each anniversary of the Certificate. However they seem to be doing exactly what I hoped they would – protecting the low risk portion of my low charge portfolio from the ravages of inflation. As always I’d like to encourage any comments. For example, what do you think of Index Linked Savings Certificates, what have I misunderstood / missed when assessing these things or do you invest in these certificates. Of course as always do you own research. I'm glad that you highlight these certificates as savings vehicles - they really do make sense for higher rate taxpayers, and even basic rate taxpayers in most circumstances. This is because interest rate changes generally lag inflation, so that it is only during periods of rapidly falling inflation or deflation that cash deposits really earn a decent return in real terms (as indicated above). Cash ISAs are now pointless since their poor rates relative to the best deposit accounts negate any tax benefits. One reason I think this could be a good time to invest in certificates is the likelihood of a further VAT rise, which will be reflected in higher inflation figures. I wonder if the chief potential downside would be a collapse in house prices, which on many measures are still overvalued. We must remember that certificates use RPI which includes mortgage repayments and house depreciation. On the other hand rising interest rates (which will have to happen at some point in the next 3 years) would push up mortgage repayments and therefore the RPI. Thanks for sharing your opinion. It's great comments like this that will hopefully grow Retirement Investing Today into a little community where we can all share our thoughts/opinions and challenge us all to think outside the box. Is the international exposure gained by non sterling denominated etf's? Aus aside, where I see you may intend to live in the future, how do you (or don't you) manage currency risk or do you rather take the view that with sufficient diversification all will be well? Excellent blog by the way, really informative. The international ETF's/Funds that I own are mostly sterling denominated. 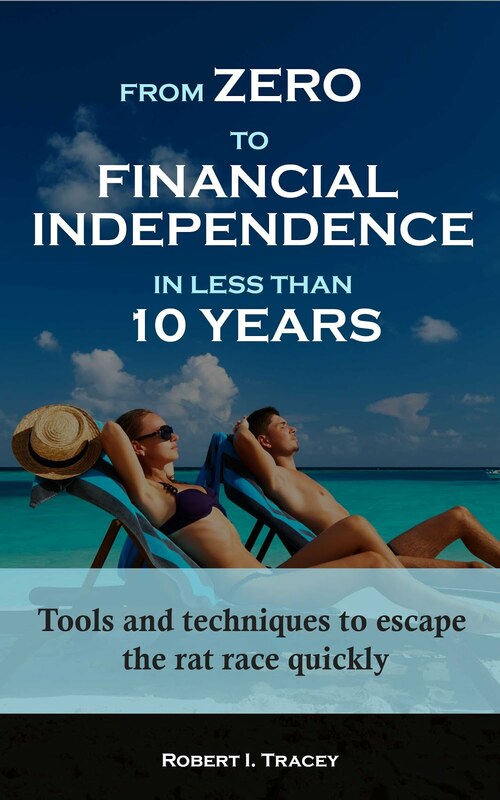 This is mainly to make buying and selling them easy via an internet trading platform (into an ISA for example). A very few are based in foreign countries. For example my Australian equities are held in AUD. In my case when all is said and done there is no real benefits to me at the moment between international exposure via a sterling or non-sterling denominated ETF. Best demonstrated with an example. I'm based in the UK and want to buy the S&P500. I can either buy in a sterling fund which converts the amount to USD within the fund or I can buy in USD meaning I have to convert before I buy. No difference as far as I can see. I don't actively manage currency risk at all. For example I don't hedge currency or buy funds that hedge countries. There's a method to my madness here. That is that I might pick up a bit of extra diversification via currency exposure. One thing I will however be watching for as I get closer to moving to Australia is to pick times when the GBP:AUD exchange rate is favourable to move significant cash to AUD. I currently watch but only move small amounts into AUD as I still expect to spend a few more years in the UK. There's probably a good post explaining these points a little further which I might rustle up in the near future. 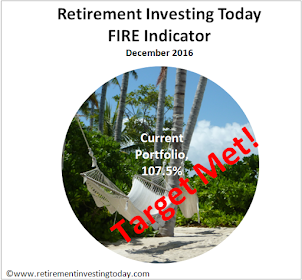 My main focus, as I detail on the blog, is achieving my target asset allocation which is a combination of both strategic and tactical asset allocation. I've always thought that NS&I index-linked certificates are a great investment, in particular for pensioners (who want to keep their assets in cash rather than risk exposure to fluctuations in asset valuation). Especially if they are higher-rate tax payers, in view of the tax-free status of the certificates. However, I'm fascinated to see them proposed as a potential investment for someone who is trying to build wealth towards retirement - especially if you are trying to accelerate that retirement date!! In your article, you point out that the certificates perform well versus cash returns. But 20% portfolio weighting towards NS&I seems high. If you're at a stage of life with (hopefully) 4 or 5 decades left to live, don't you need to be investing your money in asset classes with a little more oomph! ?